Image caption Eric Jensen (right) and Ryan Jensen (left) have called the outbreak a "terrible accident"
The owners of a Colorado cantaloupe farm linked to a 2011 food poisoning outbreak which killed 33 people and made 147 ill have pleaded guilty to selling tainted fruit. Brothers Eric and Ryan Jensen admitted to six counts of adulteration of a food and other charges. 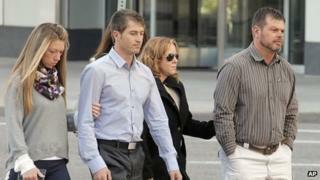 Each faces up to six years in prison and up to $1.5m (£936,856) in fines. Inadequately washed melons sparked an outbreak of listeriosis which stretched from California to Virginia. A US Food and Drug Administration inquiry found Jensen Farms installed a new cantaloupe cleaning system - designed to clean potatoes - in 2011. The system included a chlorine spray meant to sterilise the melons, which was never used. As a result, their farm sent at least six shipments of contaminated cantaloupe to 28 states. Eric Jensen, 37, and Ryan Jensen, 33, had said the outbreak was a "terrible accident". "The defendants have now admitted that they failed to protect the public from deadly bacteria on their cantaloupe, in violation of the law and critical [US Food and Drug Administration] requirements," US Attorney for Colorado John Walsh said in a statement. "Their actions resulted in tragedy nationwide, and profound economic consequences for an entire industry." The Jensens are scheduled to be sentenced in January.